Ash Wednesday begins March 6…You can walk-in for ashes at these times, or come to one of the Masses and receive ashes. We’ll be at NCC with our satellite bus to give out ashes from around 10:50am-11:15am. Youth Ministry Winter Kick-off with Pizza! 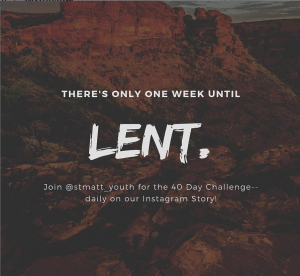 The mission of St. Matthew Youth Ministry is to provide a safe, fun, and welcoming environment where every young person can encounter Christ through prayer, service, and those around them. 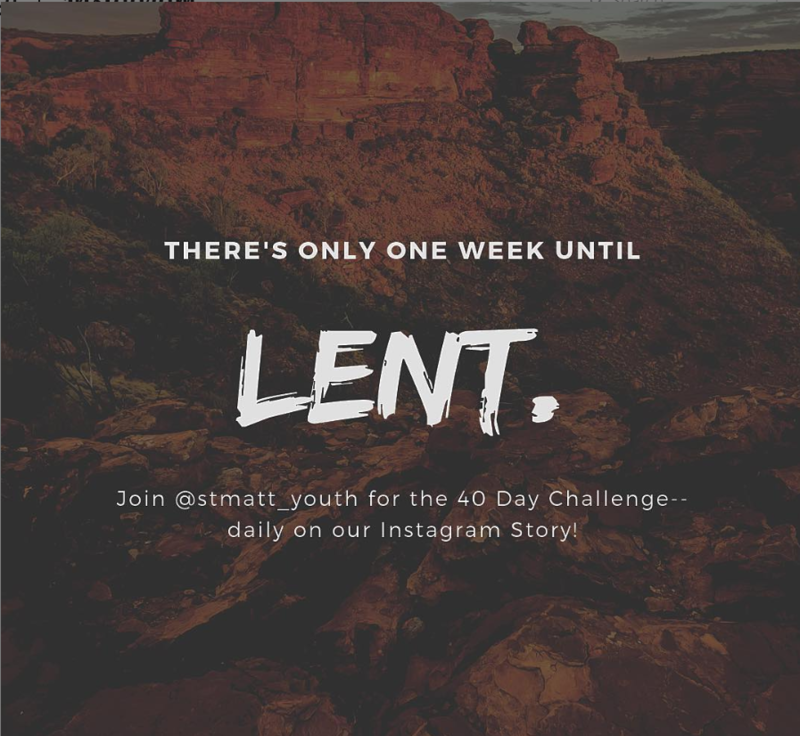 Through youth group nights, liturgical ministry, service opportunities, prayer, and discipleship, St. Matthew Youth Ministry aims to create a community of young people committed to living out their faith and using their unique gifts to serve God, St. Matthew Church, and the world. 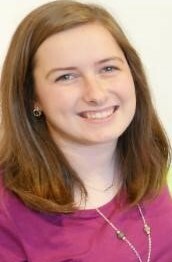 Corinne Murphy, YM Coordinator: 203-838-3788, ext. 106; YouthMinistry@StMatthewNorwalk.org. I am so excited to be joining St. Matthew’s as your youth minister. A little bit about me– I grew up in Wilbraham, MA with my parents and three sisters. I studied Theology and Human Services at Assumption College in Worcester, MA. Most recently, I was a Life Teen Missionary in the North Georgia mountains. As a missionary, I spent a year working in youth ministry in a variety of ways—through leading retreats, engaging in community outreach, going on mission in Haiti, mentoring at a local middle school, helping put on ten weeks of summer camp, and more. I chose to work in youth ministry because when I look back to my high school years, I can remember so clearly how much I needed it. My parish did not have a youth minister, but what we did have was a dedicated group of parents who would bring us to youth conferences and do their best to put on meetings and community service events for us throughout the year. It was through these volunteers and the conferences that they brought us to that I learned who Jesus was; beyond just an intellectual understanding, I came to know Him as a God who saw me, loved me, forgave me, and had plans for me beyond my wildest dreams. My life hasn’t been the same since. Pope John Paul II said that, “Life with Christ is a wonderful adventure!” I’ve loved the adventure Jesus has taken me on so far, and I am so happy that the adventure continues here at St. Matthew’s. I arrived here last week, and I have been nothing short of amazed by everyone I’ve met. St. Matthew’s truly is a parish that doesn’t just stay in the pews! I’m very impressed by the different groups and ministries, and excited to join the ranks. I will predominately be working with the middle schoolers, high schoolers, and students at Norwalk Community College, running youth groups, events, trips, and community service. I have lots of ideas, but would love to hear any ideas that you have! All of my contact information is in the bulletin, and I would love to hear from you. We will be having a Youth Ministry Kickoff Dinner on February 10th following the 5PM Mass to discuss and hear your input on the vision for youth ministry going forward. The dinner is geared towards middle and high school youth and families, but is open to all. Please see the bulletin in the coming weeks for more information, and to RSVP. I look forward to seeing you there! Thank you all so much for your warm welcome. Please pray for me, and know of my prayers for you.